On Wednesday 13 December, the Carers Trust Heart of England Young Carers Services held their Young Carers Family Christmas Party at the Britannia Hotel in Coventry. A young carer you may help out by going shopping, cooking, cleaning, making sure the person you care for takes their medicine, talking and listening to them when they are not very happy, look after brothers and sisters or anything else that helps out at home. The Carers Trust Heart of England can help young carers by listening to when they need to talk, giving them information and advice and support, arrange trips and activities to give them a break from your caring responsibilities and support you through any troubles you may have in school. The party was attended by over 100 Coventry young carers and their family members. There was face painting, glitter tattoos, amazing magic from Coventry favourite Jester Styles, people were dancing with the beautiful snow queen and even Santa popped in with his elves to hand out presents and led an impromptu conga around the hotel! Mark Graham, Young Carers Family Information, Advice and Support Worker said. The party was run as part of the Big Lottery funded Young Carers Services based at the Carers Trust Heart of England. Find out more about the Young Carers Project including a recent appearance on Children In Need. Christmas can be a magical time full of family, lights, decorations and festivities. For people living with dementia and carers who support them, the changes can be sometimes be challenging. These ‘top tips’ for supporting someone with dementia were developed by people living with dementia working with Alzheimer’s Society. Keep routine as familiar as possible - Meals at the same time and in familiar surroundings can help your loved one relax. Be mindful of food - Although people tend to indulge more with food over the festive season, a full plate can be quite daunting for someone who has difficulties with eating, so try not to overload people’s plates. Play some familiar Christmas music or reminisce over old photos - We’ve found that music and photos the person relates to can help them to relax – and can also add a nice to touch to your festivities! Musical events - We know that singing and listening to music can help people with dementia communicate, improve their mood and leave them feeling good about themselves. Many people with dementia are still able to enjoy music and sing long after they have started to lose their language abilities. It’s good to talk - Alzheimer’s Society’s online community Talking Point is always ‘open’ and is a good place to ask advice, join in discussions and feel supported by others. It includes this page where Carers have shared their ‘Coping with Christmas advice’. 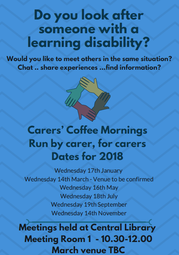 The Carers Coffee morning is held every other month and is an opportunity for carers of adults with a learning disability to get together, socialise and find out more about the services out there. There will usually be a speaker to talk about services out in the community. If you are interested in finding out more pop along to the first group which will be held on Wednesday 17 January at 10.30am. 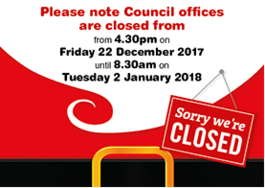 The Carers Trust Heart of England Information and Advice Service will be closed from Saturday 23 December to Tuesday 2 January 2018. The usual advice line will be open on the 27 / 28 and 29 December with reduced hours.